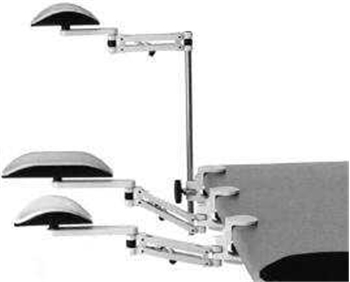 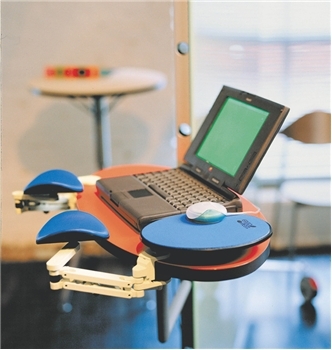 ERGOREST® has spent over a decade working on human factors and ergonomic principles in the adjustable clamps that attach the support to a fixed object (such as a desk, table top, etc), and a durable height-adjusting screw allows for a dynamic range of applications. 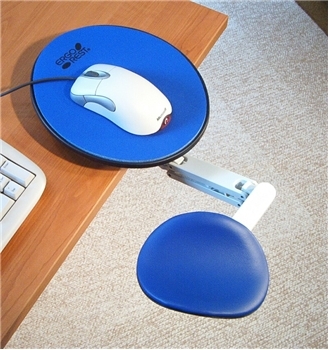 The maximum operating span for the standard ERGOREST® forearm and wrist support model is 23.5cm (9.25" inches), the maximum load bearing capacity is ~12 kg (about 26 pounds), and the height adjustment is a generous 75 mm (2.95" - providing nearly three inches of travel). 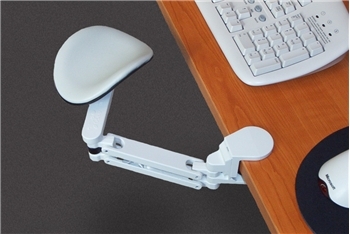 ERGOREST® fabricates their forearm and wrist supports from aluminum alloys and tough nylon fibers (polyamide). 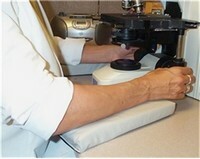 The pad itself is upholstered with rich, genuine leather. 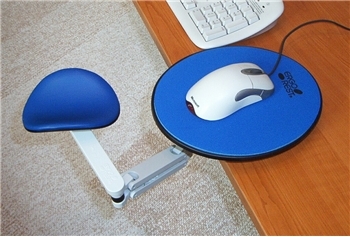 Standard Clamp: From 1" to 1-5/8"
Tall Clamp: From 1-5/8" to 2-1/2"
Tall Clamp w/Mouse Post: From 1-5/8" to 2-1/2"